In the light of sensational new reports of the US intelligence agencies spying on Brazil and its neighbours, Brazil and Argentina have decided to step up cyber-defense cooperation. “We have established that we will hold a meeting in Brasilia before the end of the year to intensify our complementarity in the matter of cyber defense,” Argentine defense minister Agustin Rossi said after talks with his Brazilian counterpart. “We need to reflect on how we cooperate to face these new forms of attack,” Brazil’s defense minister, Celso Amorim, said at a conference in Buenos Aires. 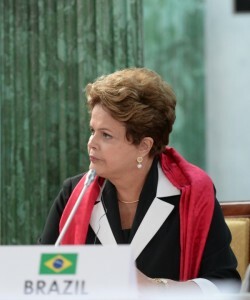 The Brazilian Senate is probing claims the NSA monitored emails and intercepted phone calls of President Dilma Rousseff and several of her top aides. “Starting in 2014 Brazil will provide cyber warfare training to Argentine officers. ? ?The combined efforts will allow Brazil and Argentina to “diminish situations of vulnerability,” Rossi said. Rousseff is pushing new legislation that would seek to force Google, Facebook and other internet companies to store locally gathered data inside Brazil. The new legislation when it takes effect would force foreign-based internet companies to maintain data centres inside Brazil that would then be governed by Brazilian privacy laws, officials said. Rousseff has indicated that she is considering urging other countries to take similar measures against US prying when she speaks at the United Nations General Assembly later this month, a senior Brazilian official said. Brazilian lawmaker Alessandro Molon has already met Rousseff to discuss the proposed law, following which the President’s office filed a motion in Wednesday’s edition of the government’s official gazette that seeks to force Congress to vote on the new bill in the next 45 days. Molon has been pushing Congress since 2012 to pass a bill known as the “Internet Constitution.” The law would establish Brazil’s first legal framework for users’ rights online, and among other requirements would force social media companies to delete users’ data once they close their profiles. Reports aired by on the “Fantastico” news show broadcast by Brazil’s Globo Television revealed that the US National Security Agency (NSA) is snooping on conversations of the Brazilian President, including emails and telephone calls as well as communications of its oil giant Petrobras.